MISSION, KS--(Marketwired - Dec 10, 2013) - (Family Features) After returning home from a long day at work, a weekend soccer tournament or an all-day shopping excursion, it's natural to want to drop everything and relax. However, literally dropping everything can cause a tremendous amount of clutter in the home, leading to stress, misplaced items and wasted time. To eliminate the clutter that busy lifestyles create, try establishing designated drop zones throughout your house to regain a sense of order. Don't worry, you can still drop everything and relax when you come home -- just drop everything in the right spot. As the first and last access point of your home, a lot of activity occurs here. Coats, scarves, hats and bags are dropped everywhere, while dirty shoes are kicked off and left behind. Basically, the entrance to your home can become a minefield. 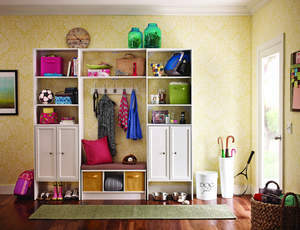 To control unruly entryway clutter, try creating a drop zone near the door. The addition of a coat rack or hooks make it easy to hang up outerwear, while a storage bench, like ClosetMaid's 3-Cube Bench, is a convenient place to take off shoes and neatly stow them away. Don't let relaxation be delayed because of disorganization. Depending on the size of your living room and how you use the space, you may need to establish several drop zones. For example, a coffee table tray or basket is ideal for storing remotes and chargers. Add storage cubes with bins as a convenient place to store and hide laptop cords, tablets, gaming equipment and children's toys. Consider labeling a bin for each family member to "drop" or stow their stuff. To clear clothing clutter, use a valet rod to hang up tomorrow's outfit or clothes that need to be taken to the tailor or dry cleaner. Additionally, try designating a dresser drawer as a drop zone for jewelry, watches, your wallet or other valuables.